M1 industrial property. Perfect for parking big trucks. 6 miles from freeway 99. 3 adjacent lots totaling 2.01 Acres of M1 zoned property. Close to freeway 99, and in the Industrial area of South Fresno. Total of sq ft. 91,738 Lot is being sold as Vacant land. Buildings are of zero value. 2475 and 2465 and 2459 S Orange. Value is in the land. 2459 S Orange is 36,504 sq. ft, APN - 480-261-32, Lot Dimensions 117X312 , Acreage 0.84, Block/Lot 34. See Plat Map 34,33,32. 2475 S Orange,Zoning Code M1, APN/Tax ID 480-261-31, Lot Square Feet 18,730, Acreage 0.43., Block/Lot/32 Lot . 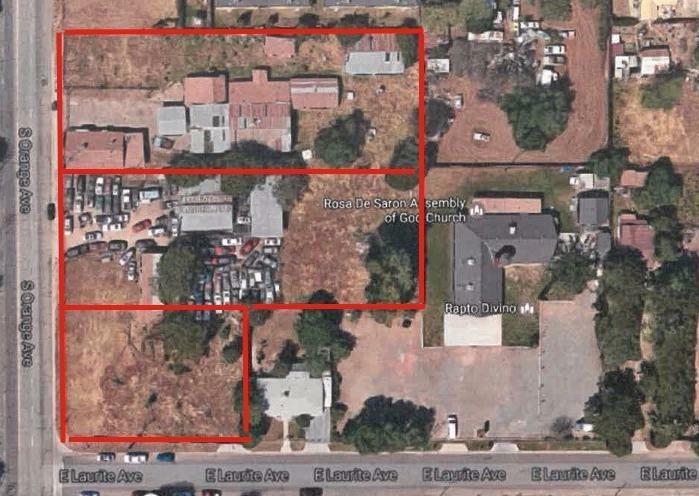 Dimensions 160 x 114, Property Address 2465 S Orange Ave Fresno, CA 93 Zoning Code M1 APN/Tax ID 480-261-33, Land Use Industrial Vacant Land Lot Dimensions 117X312 Block/Lot /33 Lot Square Feet 36,504 Latitude/Longitude 36.711824/-12 Acreage 0.84 $4.30 per Sq. Ft. Listing provided courtesy of Michelle Greene of Keller Williams Realtytulare.